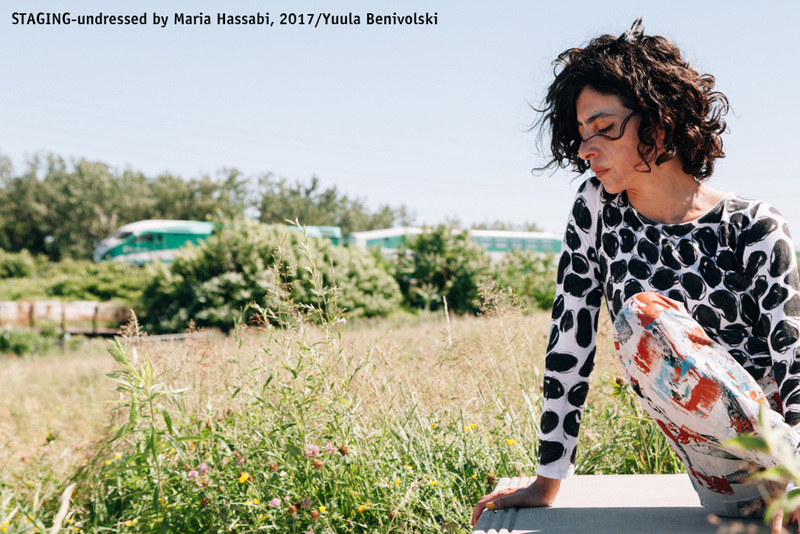 On July 7 and 8, walkers, bikers and art enthusiast on the Don Trail experienced Maria Hassabi’s original performance of STAGING – undressed, marking the first event of our art program! 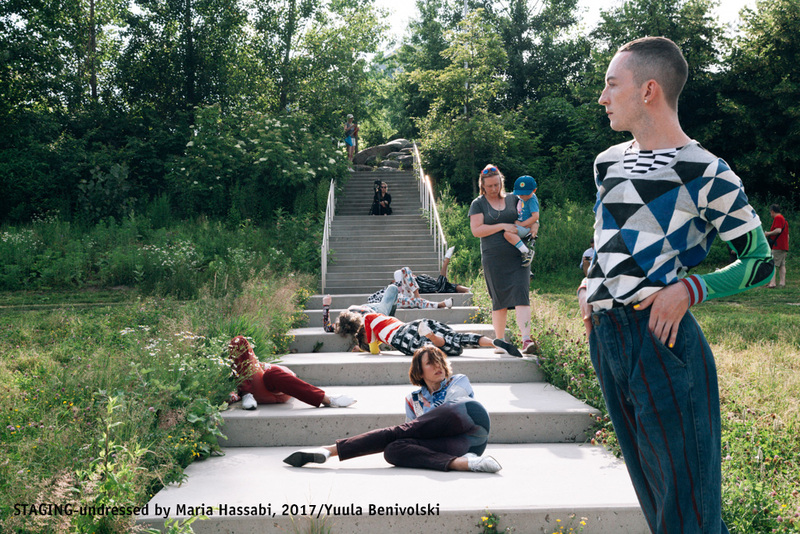 A team of seven dancers took to the Lower Don, presenting themselves as living sculptures with no beginning or end, using time as a technique and as a subject. STAGING focused on the contours of stillness or slowness, while addressing the ways in which the spectacle of performance is presented within exhibitions, and in relation to architectural environments and public space. Hassabi’s performance encouraged new relationships to the spaces along the Don we tend to move through without notice. As visitors came and went by foot and bike, some stumbled on the unexpected performance. More than 500 people took in the unique performance, and while some viewers sat at a distance to watch the performance unfold, others walked up the staircase, weaving around the performers, to get a closer look. A group of children decided to join the show themselves, mimicking the performers’ poses and creating new choreography. This was Hassabi’s first time performing in Canada and in a park environment. Although the outdoor setting offered several challenges — including a decent amount of rain — performers were quick to adapt to the new climate and put on a memorable show! The event wouldn’t have been possible without the support of our volunteers, Art in the Park, the City of Toronto, and the Toronto and Region Conservation. Maria Hassabi (b. 1973, Cyprus) is an artist and choreographer. Over the years she has developed a distinct choreographic practice that triangulates an ever evolving relationship between the body, the still image, and the sculptural object. Her performances and installations have been presented internationally in theaters, museums, galleries, and public spaces. They have been included in festivals, venues, and exhibitions including: documenta14, Kassel (2017); Stegi OCC, Athens (2017); Walker Art Center, Minneapolis (2017); Kunstenfestivaldesarts, Brussels (2017, 2014); Museum of Modern Art, New York (2016); The Kitchen, New York (2016, 2013, 2011, 2006); Hammer Museum, Los Angeles (2015); Stedelijk Museum, Amsterdam (2015); ArtSonje, Seoul (2015); Australian Centre for Contemporary Art, Melbourne (2014); steirischer herbst, Graz (2014); The 55th Venice Biennale, Venice (2013); Performa, New York (2013, 2009); Centre d’Art Contemporain Geneva, Switzerland (2012); Performance Space 122, New York (2009, 2007); amongst others. Hassabi has been awarded: a 2016 New York Dance and Performance “Bessie” Award for Outstanding Production for her work PLASTIC; the 2015 Herb Alpert Award; the 2012 President’s Award for Performing Arts from Lower Manhattan Cultural Council; a 2011 Guggenheim Fellowship; and a 2009 Grants to Artists Award from Foundation for Contemporary Arts. Hassabi holds a BFA from California Institute of the Arts. She is based in New York.